In a time at the very dawn of history, man is not much more than a primitive savage struggling to eke out an existence in the harsh; volcanic landscape; it is a time when huge dinosaurs roam the earth (!) and man is not only the hunter but also the hunted. Against this backdrop, Tumak, the son of the leader of the Rock tribe, battles with his brother Sakana and is banished into the desert. Somehow surviving the rigours of the wilderness, he reaches the shore of a great ocean and there he joins the Shell tribe, a peaceful, more advanced people, and meets the beautiful Loana….. 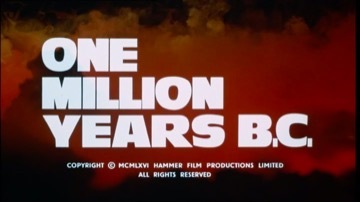 Billed as their 100th film, “One Million Years B.C.” turned out to be Hammer’s biggest money-spinner. It is a remake of the 1940 Hal Roach production “One Million B.C.” (aka. “Man and his Mate”), hence the credit to the original screenwriters of that film. Anachronistically placing man in a world still populated by dinosaurs, the film features the stop-animation effects of cinema wizard Ray Harryhausen and was nearly a year in production, thanks largely to his painstaking work as well as extensive location filming in the Canary Islands. Inspired in his youth by the genius of Willis O’Brien, the man who brought the original “King Kong” to life in 1933, Harryhausen’s own creations include “The Beast from 20,000 Fathoms” (1953). After that he worked mainly with producer Charles H. Schneer on “It Came from beneath the Sea” (1955), “Earth vs the Flying Saucers” (1956), “20 Million Miles to Earth” (1957), “The 7th Voyage of Sinbad” (1958), “The 3 Worlds of Gulliver” (1960), “Mysterious Island” (1961), “Jason and the Argonauts” (1963), “First Men in the Moon” (1964), “The Valley of Gwangi” (1969), “The Golden Voyage of Sinbad” (1973), “Sinbad and the Eye of the Tiger” (1977) and “Clash of the Titans” (1981). thin air (the dinosaurs were of course added later) and therefore had no difficulty choosing Don Chaffey, who had directed “Jason and the Argonauts”. Chaffey returned to Hammer later in 1966 to direct “The Viking Queen” and again in 1971 for “Creatures the World Forgot”. After their success with Ursula Andress, Hammer adopted a policy of trying to nurture the talents of largely unknown, beautiful young actresses, not always successfully. With this film, however, they managed to catapult Raquel Welch into the cinematic firmament (with a little help from that prehistoric designer bikini, of course!). Actress Martine Beswick had appeared in the James Bond film “From Russia with Love” (1963) and later starred in Hammer’s “Slave Girls” (1968). However, her best role for them was to come in 1971, when she played the female half of the mad scientist in “Dr Jekyll and Sister Hyde”.